Do you want to change the appearance of your Landscape? Then let us dramatically redesign your Curb Appeal! Look around our website and see what we can change your Landscape into. Drop us an email or leave us a message on the phone and we will be glad to reply and make arrangements to come out and give you a free quote. Call us and see if we can assist with any drainage issues you have with storm runoff. As you can see we specialize in curbing around your flowerbeds, walkways, tree rings etc.. We also do Retaining walls, Patios and many other hardscape designs you might have an interest in.. Thanks for dropping by. 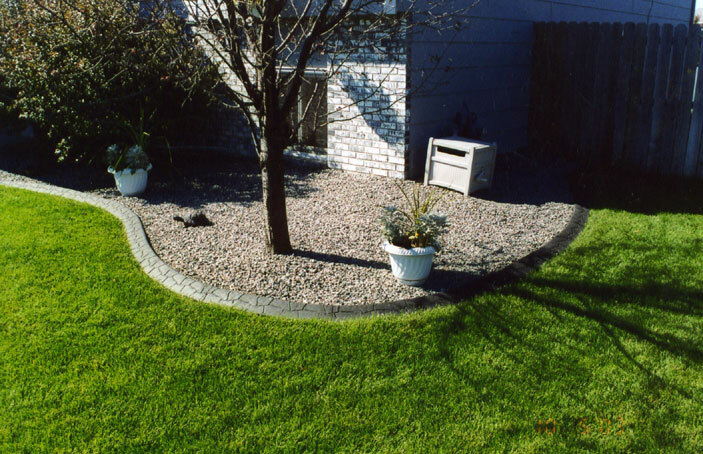 Enhance your home and yard with curbing. Curbing is a continuous, concrete border custom-made to fit any landscape design you desire. 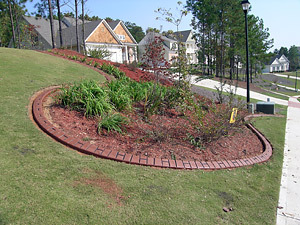 Landscape curbing is an innovative way of making your flower beds and walkways look great. It is one continuous piece of concrete that can be poured in all sorts of ways. It can be colored in various shades and can be stamped with certain stamps. * Decorative curbing brings instant curb appeal to any landscape. * It compliments but doesn't overpower yards. * And it beautifies any setting, permanently. * Decorative curbing is a very cost-effective improvement. * Curbing is proven to increase property values. * And it adds distinction between beds, lawns, property lines, and other boundaries. * Decorative curbing is appropriate for any climate or topography. * A wide selection of colors, curb styles, and stamp patterns for any taste. * And it works for new yards or as a value added improvement. * Decorative curbing is permanent and maintenance free. * It prevents erosion and preserves bedding material. * And it reduces the cost and time of maintaining beds & makes edging much easier. Call Us Today! If This is what you are looking for!